Worship the Father or Jesus? 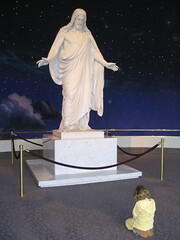 Do members of the LDS church worship Heavenly Father or Jesus Christ? This is the Almighty of whom I stand in awe and reverence. It is He to whom I look in fear and trembling. It is He whom I worship and unto whom I give honor and praise and glory. He is my Heavenly Father, who has invited me to come unto Him in prayer, to speak with Him, with the promised assurance that He will hear and respond. He is the Savior and the Redeemer of the world. … I worship Him as I worship His Father, in spirit and in truth. I thank Him and kneel before His wounded feet and hands and side, amazed at the love He offers me. We believe that worship is far more than prayer and preaching and gospel performance. The supreme act of worship is to keep the commandments, to follow in the footsteps of the Son of God, to do ever those things that please him. It is one thing to give lip service to the Lord; it is quite another to respect and honor his will by following the example he has set for us. The Oxford Dictionary defines ‘worship’ as “the feeling or expression of reverence and adoration for a deity”. So whom do we worship? Do we only worship the Father in Jesus’ name? Or can we worship Jesus as well? Since they are “one”, is it wrong to worship Jesus as well as the Father? Is such an act misguided and disrespectful? If to worship is to have feelings of reverence and adoration, can we not have these feelings for both God and His Son? If, as Pres. Smith says, to worship is to keep the commandments, and we are given God’s commandments through Jesus, can we not worship both of them? Note: for further discussion on this topic, visit Blogger of Jared or By Common Consent. I believe that Jesus has shown the example for worshipping the Father. Jesus, I believe, knows His “place” with the Father, and that we can emulate His worship of the Father. In general, the Father is the object of our worship, and the Son is the means to our worship. To worship is to pay homage to the Father. We pray and we bless “in the name of Christ” which is, I believe, the key to being recognized or identified by God the Father. To worship in the name of Jesus probably means “using” or referencing the name of Jesus which gives us license or authority to approach God. The name of Jesus is used to validate our woship, to authorize our prayers and requests. I think the phrase “to take the name of the Lord in vain” actually means to use this authority vainly. On a side note, it may also refer to the act of abusing the authority of the priesthood by practicing unrighteous dominion as defined in D&C 121. Based on the evidence here as well as what has been supplied – and what else exists the LDS have what is called a contradiction. Are we to worship the Holy Spirit? This question has been raised due to the fact that direct command is not given to worship Him in the Word of God. First, we must remember that the Bible was inspired by the Holy Spirit. But know this first of all, that no prophecy of Scripture is a matter of one’s own interpretation, 21 for no prophecy was ever made by an act of human will, but men moved by the Holy Spirit spoke from God. So if in the Word of God we were to find a passage saying “Worship the Spirit of God,” it would be the same as the Spirit saying “worship me”. The Spirit will always demonstrate the same character as the Son. The Son did not glorify Himself. He waited for the Father to reveal his glory. Jesus wasn’t after vain glory. He didn’t want people to hypocritically honor Him. He wanted for the Father to bring a true revelation of His deity and glory to those He chose to reveal this to. Although Jesus never ordered worship for Himself but rather waited for the Father to reveal his worthiness, He did receive worship when given. The scripture says to worship only God. So acceptance of worship was proof that Jesus was God. If we are to worship God, than the Spirit of God is worthy of worship. The fact that the Spirit does not command us to worship tells us that He too waits for the Father’s revelation of His worthiness. In the Old Testament, the Father’s deity was contested by false gods. In the New Testament, the Son’s deity was contested by the Jews. In our time the deity of the Holy Spirit is being contested by some circles of Christians. If we can’t worship Him, we are saying He isn’t God. The fact that He lives inside of us doesn’t mean we can’t worship Him. We are not worshipping ourselves if we worship His manifest presence. Jesus received worship while living in a mortal body. That doesn’t mean He was saying mortal men are worthy of worship. He was God even while trapped in time and space by His own will and the Father’s will. The idea that worship of the Holy Presence of God is occultism is blasphemous. Either He is God and worthy of worship or He is not God at all. The distinctive attributes of deity are omnipotence, omniscience, and omnipresence. They existed in eternity before creation and they are Creators, not creation. These are the Triune God we serve and we have no evidence to conclude that despite their agreement in all of these factors, they would consider one of themselves unworthy of adoration.